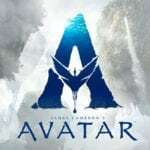 Starring Channing Tatum, Adam Driver, Daniel Craig, Riley Keough, Katie Holmes, Seth MacFarlane, Jack Quaid, Brian Gleeson and Katherine Waterston. Out of work and with alimony payments to keep up, Jimmy Logan comes up with a plan to make some fast money. He and his brother Clyde will rob the vault at the new NASCAR stadium nearby. But they can’t do it alone. They need an explosives expert and the best in the business is languishing in prison. His name is Joe Bang. 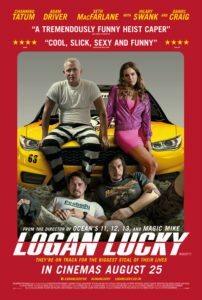 While the Ocean’s franchise was all slickness and polished chrome, Logan Lucky is grubbier and all the more recognisable for it. Everybody thinks the Logan brothers are stupid and unlucky yet, for once, Jimmy gets it right. His plan to rob the vault – where all the money that’s been literally sucked from the punters is stored – works, after a fashion. You’d think that the brothers simply don’t have what it takes to pull off a stunt like this. And you’d be wrong. Every dog, as they say, has its day. Even non-Soderbergh fans will find it difficult to resist this one, with its cheeky, knowing charm and consistent humour: smiles and chuckles turn into huge guffaws and the laughter simply never goes away. It has its weaknesses – a tendency to lose its way towards the end and a shocking piece of over-acting from Seth MacFarlane sporting one of the worst English accents going. But, those aside, this is a joyous crime caper full of character, wit and energy. And it’s easily one of this year’s best comedies.